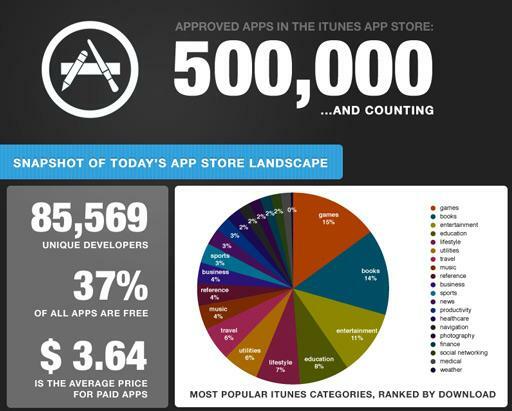 ReadWriteWeb reported today that Apple had approved the 500,000th App for their App Store. You can see the entire visualization created by app search engine Chomp, app review site 148apps and game publisher Chillingo at the link above. There is also a Facebook page – of course. I have tried to do my part – my 16GB iPad has 282 apps loaded, but I have less than 1GB of space available. I’ll write more on some of these later – especially those in the last group. I have downloaded some apps just because of the way they display data or interesting navigation – Pennant, Our Choice and The World of Tomorrow are stellar examples. ‹ Can the Energy Industry Be Trusted?